Texas Instruments introduced in the United States with the BA-20 already in the year 1986 a very useful calculator. 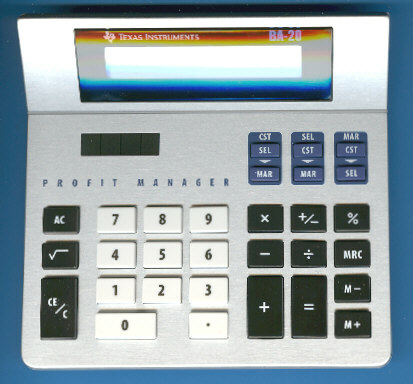 Beside the basic calculator functions 6 additional keys enable the COST, SELL, MARGIN calculations. You enter either two of the variables and get instantly the result of the remaining value. The technology inside this BA-20 manufactured in 2002 looks very similiar to the first version - a 16 years old design. Even the Integrated Circuit makes use of a traditional housing instead the common Chip-on-Board (COB) technology. An earlier version of the BA-20 sports an integrated clock like the European TI-610. In August 2002 the design of the BA-20 was slightly changed to allow the usage of larger solar cells.